Let’s face it, pumping breastmilk is a task. You may not produce a lot when you pump, but seem to satisfy baby when you nurse them directly. This is normal, and even though not a lot comes out while pumping, it is still possible to get even more during those times when you pump. Through the use of some great tips and tricks for producing more milk, you can achieve a better pump supply overall. Check out the latest breast pumps reviews to ensure you have a quality pump to start with. Remember, it is important to keep up with your supply since overproduction can cause mastitis a wide range of other breast issues. Even though it is pretty plain and doesn't seem to boost supply, oatmeal is actually a great stimulator of milk production. Eat a bowl of oatmeal in the morning, for a snack, lunch time and at night to boost your supply so that the milk will flow the next time you go to pump. It is also delicious when you add yogurt or fruit. Overnight oats provide a quick, easy snack that you can refrigerate and grab on the go. There are natural supplements that can be taken over the counter to boost your milk supply. These are great when taken on a daily basis. Fenugreek, Fennel and Blessed Thistle are a couple. Of course, there are others that do a variety of different ones as a mix. This provides not only a great support for milk, but a boost for mom too! Pumping on a schedule and often can help to stimulate milk production so that you’re able to pump more. When you pump, try to do so every two hours for 20 minutes at a time. After a while, you will start to see a boost in the amount of milk you’re able to pump out. It can be tiring to stick to this schedule, but even at night, it can benefit you and baby. When baby nurses on one side, pump on the other. This will help the flow of milk on both sides, providing you with a decent amount of milk that you can pump, while also being able to feed baby at the same time. It is also a great way to save some time (and some milk!) There are pumps that are rubbery and provide a comfortable alternative to electrical hard ones when nursing and pumping. 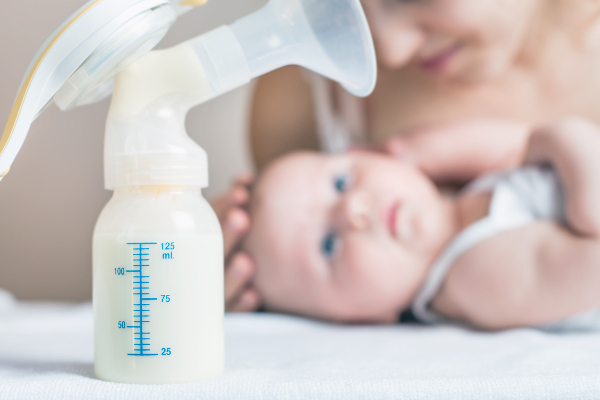 When baby starts sleeping a bit longer and those nightly feedings are not so often, pumping when they normally would be can help to build the stash up and give you more of a supply. This is because you work on a supply and demand. When the demand for milk diminishes, so does the supply. Keep up with the demand with the pump and boost your supply. Many cookies, brownies, smoothies and more can be purchased through various shops online and in natural health food stores, or bake at home. These items that all have the necessary milk boosting properties can help your milk stash and provide you with a way to pump more milk without having to worry about underproduction. Milk supply is a tricky thing. Some women overproduce and some women under produce. Whatever you are, it is important to stay with it. Breastfeeding is hard at first, but even with regular pumping, you’re still producing enough to feed baby. Eat a balanced diet and drink plenty of water and you should have no issues supplying the milk that baby needs to grow up big and strong.